My apologies for disappearing for over a month! Demand for information on a host of new products has had ns run off our feet here! CL900: – Has progressed to production process. Will be here in a matter of weeks. Delays on the new Intel Atom chip have held all at these new tablets up. Will be worth the wait! Docking station will be under AU$250. Q550: – Fujitsu have released models and pricing. Starting from $1349 and expected around EOM. 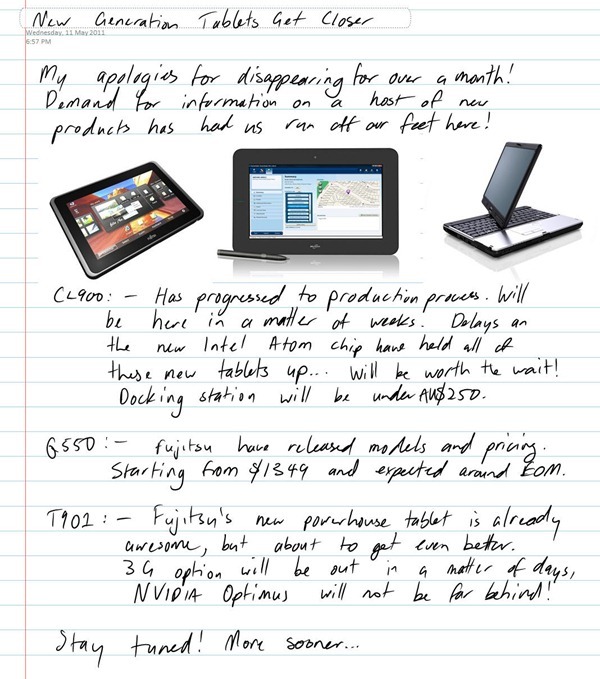 T901: – Fujitsu’s new power-house tablet is already awesome, but about to get even better. 3G option will be out in a matter of days, NVIDIA Optimus dedicated graphics will not be far behind! first of all, it’s a very nice website you have here! I have to chose a new laptop for work (research institute) and I was planning on getting my first tablet PC. I want to use it for taking notes in meetings, typing ist usually a bit too disruptive and doesn’t allow you to sketch thoughts really well. I also plan on printing less scientific papers and start reading & annotating them on the tablet. Same goes for Bachelor/Honours/Master theses. Ideally the screen would be readable in bright, sunny conditions (on a train at a window, at home in the backyard….). Since it will replace my desktop too, I want a newer generation i5/i7 with an SSD. I was going for the lenovo x220 tablet with the outdoor viewable screen. It was supposed to become available 6 weeks ago, still nothing. Now I have been looking for alternatives and found out about the T901. A bit bigger but far less obtrusive extra battery and 16:10 instead of the (in my eyes stupid) 16:9 aspect ratio. Looking good BUT: What about the display? Is this going to be usable with the sun shining at it through a train window or me reading PDFs outdoors without pinching my eyes all the time? Hi Andy, T901 uses a high quality wide viewing BOE hydis display. It is very good in sunlight and has some good features like a polarizer on the display for better light passthrough. You’ll be fine on the train. The unit itself is manufactured in Japan, but I beleive that a lot of the design work is done in Germany. Battery time is great thanks to the new Sandy Bridge i7/i5 processor and 6 hours is realistic from the standard battery. Throw in the extended battery and you will never seem to run out! thanks for the feedback. So I suppose you would recommend getting the t901 over the x220t then? I know about the battery, even with the extended it won’t add to the unit’s boundaries whereas the x220t 6cell + slice will at some 50% of volume to the unit. So that speaks for the fujitsu. Since the device has been available in OZ for a while I wonder why I can’t find any detailed reviews on the unit yet. Does anyone have a link? Hi Andy, yes I’m more of a fan of the Fujitsu T901. Interal batteries are great and performance is very impressive too. Bear in mind that that they all use basically the same panels. Calibration is a factor for all Wacom panels. Some individual panels seem better than others out of the box, but all can generally be calibrated to within reason. The best way to overcome the calibration problem is to train your brain to watch the dot on the screen (cursor), not the pen tip (which is native). Once you master that, I would tend to bias the calibration so that the cursor is always visible and in front of the pen for best results. T901 is also better because there a nice gap between the screen bezel and the edge of the display (about 2-3mm). I am wanting to get a review up, but the demand is keeping me too busy! I actually had to sell my demo unit last week as stock is limited and someone was desperate for one! New one on the way this week and I’ll get a review up. thanks Brett, looking forward to it! One thing you might be able to clarify early though: The design and coloring. Is the keyboard white or black now? There are images of both but I haven’t seen any website offering to opt for either. For instance, your image on top of this news entry shows a silver laptop with black keyboard and black screen? T901 has a light grey keyboard. Fujitsu’s business / corporate hardware is light grey keyboard / white keys, home hardware (H series, i.e. TH700, TH550) is black. but why do most the official images of the device show a black keyboard? Hmmm, yes I see what you mean. I was thinking of the Bezel around the keyboard, but I’m pretty sure our T901s here have a white keyboard too. It may be just the SKU that the order in Australia. I know there is an option for a spill proof keyboard. Maybe that is associated with the difference. I keep wondering about the battery life. Seems like the endurance of the predecessor (T900) was quite disappointing and VERY far from what fujitsu claimed. What about this one? I know the official numbers are probably BS for any vendor but Apple (I achieve exactly 7 hours, which is what they claim with the MBP), but I hope it is more than half of what they claim. 9-14h for integrated + extra battery. Another thing that baffles me is the fact that the datasheet lists two standard batteries, one with 67Wh and one with 63Wh, with the prior mysteriously charging some 30% faster. Why both these option, what’s the catch with the slightly larger and faster charging one? Hey Andy, Apple make more dubious claims than any company I know of, but strangely they are pretty spot on with battery life! The T901 battery life figures are absolutely wrong IMO, although the overall 14 hours would certainly be achievable. The battery charging figures are not my area of concern though, but the run time figures are. I think that 6-7 hours per battery is around about the mark of battery life that I would claim. 9 hours from battery one would be a major stretch in my experience. That said, it is way better than T900 for battery endurance! Charging is simply a factor of the battery technology used. Some implement charging faster than others, so I would beleive their figures on that although I do not have a spare battery to test. Where did you go again??? it has been over a month once more! I wish I could find more input on both (even the predecessors) but at this point I’m almost certain that I’ve overdone the thinking a bit, can’t see clearly anymore :P. I’m wondering if you had anything up your sleeve, some long-term experience that might give you the ability to push me to either side?! Unless you’re any closer to finding the time to put together that review… Greatly appreciated. Thanks Andy! Hi Andy, I’m personally very happy with Fujitsu. I’ve found their tablets to be of very good quality and I am especially impressed with the performance of the T901. That said, I had to sell it to a customer who desperately needed it, and I am waiting on stock to come in again so that I can do a review. I am also very much looking forward to the NVidia Optimus version that should arrive sometime next month! cheers… can’t wait to read what you think about it… no matter what I might have ordered until then. Was wondering when the fujitsu Q550 will be available? And whether or not you are going to be selling the Asus Eee Slate EP121? Hi Rami, yes we are currently selling the Q550. Contact us through the website for more information. Pricing will be on our website shortly. We have been selling the Asus EP121 however it will not be on sale via our website at this stage. It has sold out and we are not sure what the current status of that product is. I just went to harvey norman and bought the asus eee slate. They have also sold out and have 6 on back order. When I went in they told be that 3 of the 6 had already been sold and that they were just waiting to stock to arrive later this week to hand them to customers. So I bought it and that makes it 4 out of 6 already sold before stock has arrived. The salesman told me that both Harvey Norman and Asus did not expect sales to be so high. They are now rushing to increase production. What I’ve found is that the Lenovo doesn’t really have that much of a footprint-advantage, it’s actually deeper. It is thinner though, just has more clearance when standing on a table due to the protruding battery. Due to that angle and the overall thinner body it looks like it might be measurably more comfortable to type on, the T901 design seems to not consider the front corner as a possible problem for typing, in my eyes they should have rounded/lowered it a bit. This is just a guess though, haven’t handled the machine myself of course. Thanks for your feedback Rami. Most stores are now out of stock, and it may be some time before we see the next shipment. Glad you got one ok! David, i’ll need to check, but the Q550 price range will be between $1100 – $1600 depending on specs. Not sure if it is made in Japan though. Will have to check it out. Our Japanese made T901s are rare as hen’s teeth right now due to obvious and unfortunate Japanese production issues. Next stock is due in mid next month, and not much at that… Hopefully Q550 is not suffering the same problems. have you gotten your hands on a T901 again? Do you have any input on digitizer accuracy? Many X220T owners complain about wobbly lines (drawing diagonally over the screen edge using a ruler). Also there seems to be a great offset on the edge of the screen. Is this normal? I would hesitate to say that many owners would complain about this… got a feeling that there might be a handful at best who are trying to use it this way. Anyway, the T901 uses exactly the same high quality Wacom technology that the Lenovo X220T uses, so if for whatever reason you decide to rule lines on the screen you’ll probably get the same problem! haha, alright, didn’t mean to ask you to do so, no worries. I’m busy with other things too. Regarding Laptops…. I told myself that I’d just wait until a proper review of the T901 is out somewhere. Availability is non-existent anyways. take care and don’t burn out over all the fiscal year stuff. Hey, no problems Andy. Looking forward to your next trip and that coffee! Brett, what would you recommend over the other – Asus EP121 or Motion Computing CL-900? All my machines have been convertibles so far. I use Lenovo X60 tablet at the moment and it is adequate for MS Office type work & programming which is the majority of stuff I do on the road. Would you reckon CL900 will be OK or should I play safe and go for Asus? Stef, for you the ASUS would be preferable although very hard to get at the moment. It may be out of stock for another month or so I’m hearing. BTW, Programming is not fantastic on a slate, you really need a physical keyboard for that. The Atom Oaktrail will also be no fun for a programmer. That said, the J3500 might be an option depending on your budget as it is a kind of hybrid slate with a keyboard. Brett, I can vouch for the Asus as I am writing this post on the asus eee slate. It is faster than my old core 2 duo laptop and touch and pen input are very smooth. Great for doing real work. Brett, I am now In the market for an Atom based tablet with Active digitizer for my mum. She fell in love with my eee slate but wants something slightly smaller. All the 10 inch tablets I have looked at in the market all lack an active digitizer. My mum wants to be able to write on the screen. she does not like touch keyboards. She only uses it for email and sone basic games. would have gotten her on iPad but she wants the pen. 🙂 was hoping to buy the Fujitsu Q550 but it costs more than my eee slate! Brett, that is still More expensive than my eee slate! Rami, are you in Australia? That is the same price as the EP121 here. Hey Brett, thanks for the advice on Asus. I like convertibles as I do a lot of typing, but it’s mostly non-CPU demanding stuff. I should probably clarify that I rarely do full-blown development on laptop – it’s mostly reviews and prototyping, where I just write into editor – syntax highlighting and occasional compile/debug is about as much as I’d stress the CPU. 1. Could you shed some light on the lack of grunt with ATOM CPUs – is it noticeable when inking and swapping between the multiple things? Benchmark testa are atrocious. I usually have Outlook, multiple Word, Excel docs, One Note and browser open with multiple tabs, and swap between frequently. Will I be able to pull the tablet out for a quick scribble, or to find a note quickly when discussing with the client. What have previously turned me off is that it’s just too awkward, or too slow, or the inking just decides to lag horrendously etc. 2. Would running this thing on 1920×1080 on external monitor kill the performance? 3. Will Motion release a more office-friendly docking station (i.e. with proper video output) instead of that glorified cash register design? yes brett i am in australia. i live in sydney and i picked up my eee slate for $1400. plus the eee slate has a larger scree and faster processor plus better screen tech (IPS for the cl900 vs AFFS for the eee slate) and twice the RAM. I dont see how the cl900 or the Q550 can be for expensive than the eee slate. i expected prices closer to $1000. Guess i will have to keep looking for something more suitable. 🙂 thanks for your help anyway brett. Reading your site is what convinced to go with a windows tablet over an iPad or other android tablet. Please keep up the great work you do. Thanks Rami. Appreciate your input to our blog! oh man… availability is really not usable at all. I have both devices (Fujitsu T901 and Lenvo X220T) ordered for quite some time now… both delivery-dates keep being postponed. I guess this is the aftermath of the march catastrophe in Japan. What I can’t understand though is why the companies won’t be frank about the situation and just keep postponing possible delivery dates week after week. If the supply chain is totally gone they should be honest and tell the customer, that there is not going to be any significant production until whatever… october! How is availability down under? Any better?